Step 2 - Preparing the body. 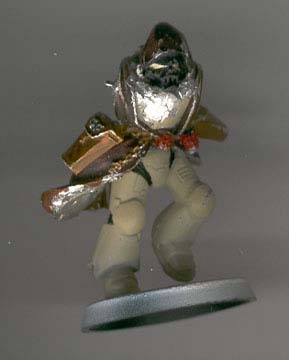 All the chaplain models in the GW range suffer from the "stand or trot while waving both arms syndrome" and the only one with a robe, "Asmodai" had already donated his body to my techmarine. 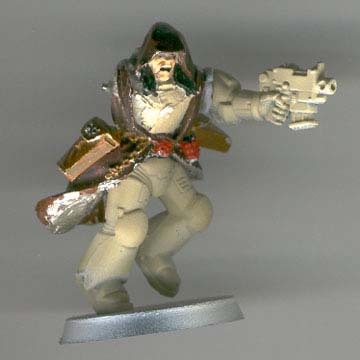 I initially chose the the most dynamic chaplain figure in the Citadel range, shown below. I planned (rather hoped!) to add a cloak out of miliput putty) The first convertion I did was to remove the head of the crozius and pin it to the bottom of its staff. 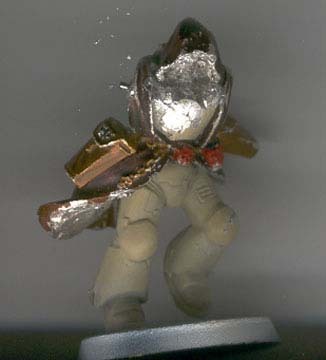 I then removed the head of another crozius from another model and pinned it to the top end. 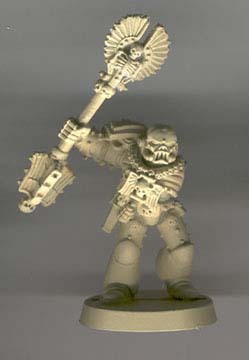 (figure 1) It was a much better head, and made the weapon stand out. 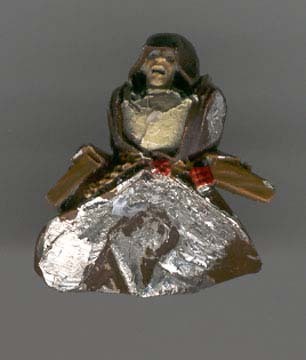 But I was no good with sculpting robes at this stage so had to go with selecting one of the robed miniatures. In came the cypher model since it was the only robed model I hadn't used up. (figure 2) I had originally painted him up as my Master of the second company, but didn't like it, and had replaced him with the limited edition Black Templar Captain figure. Besides, which Dark Angel could resist bringing Cypher to the Emperor's Light?? Having completed my 1500 point Shadow Guard Army I set about creating the next 500 points. The core of my army was mechanised and made out for a mobile and firepower based army. The models all posed in a way that represented steady firing poses. So I decided that the next lot was going to be assaulty. I had planned a ten man assault squad, each posed with different close combat or power weapons. I needed a chaplain to lead the aasault and it had to be a dynamically posed model to accompany my charging assault squad. 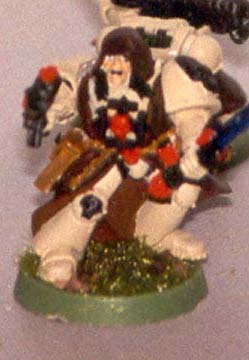 What I wanted to create was a charging chaplain in a very threatening and imposing mood armed with a master-crafted crozius arcanum and a bolt pistol.